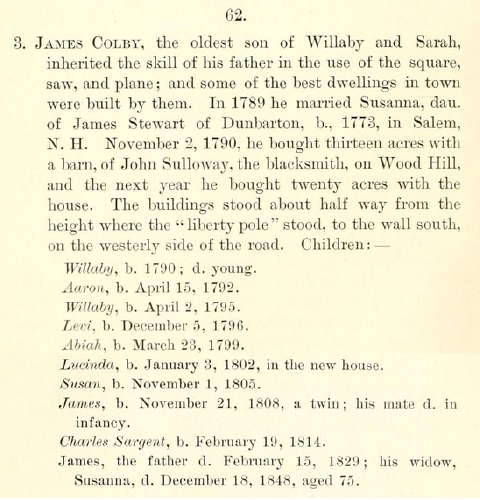 "New Hampshire Birth Records, Early to 1900," database with images, FamilySearch (https://familysearch.org/pal:/MM9.3.1/TH-267-12400-280916-27?cc=1542861 : 21 May 2014), 004243701 > image 2014 of 4642; Bureau of Vital Records and Health Statistics, Concord. She was the daughter of Irving Andrew J. Colby and Clara Lawrence Hale. Colby, Ina, music teacher. boards 1 Everett av. Colby, Ina, musician, boards 780 Dudley. 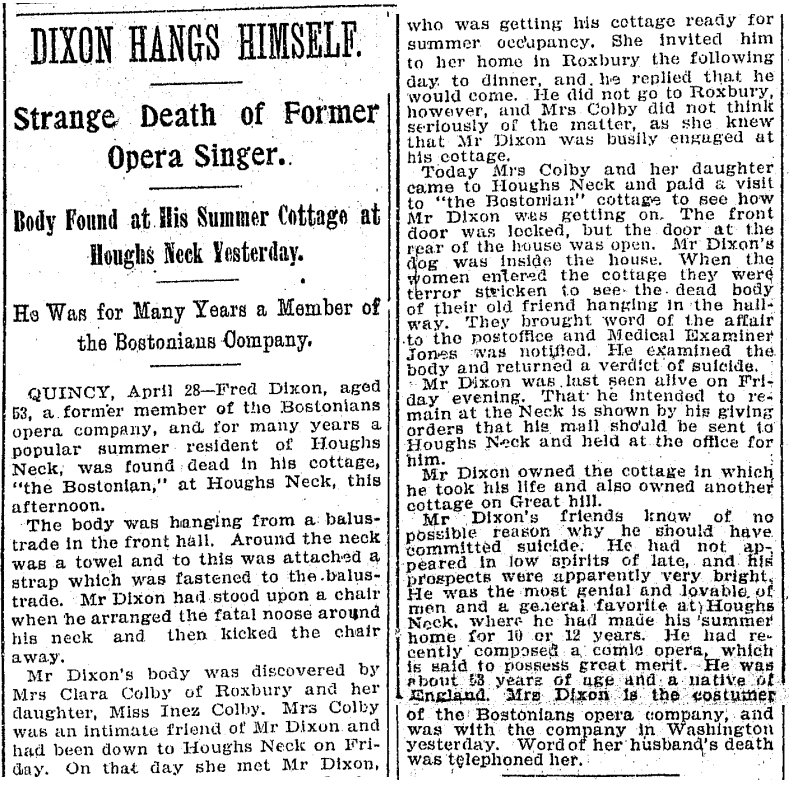 Dixon's body discovered by Clara and Ina [misspelled "Inez"] Colby. From the Boston Post of October 23, 1905. Colby, Ina, musician. resides 43 Cummings av. 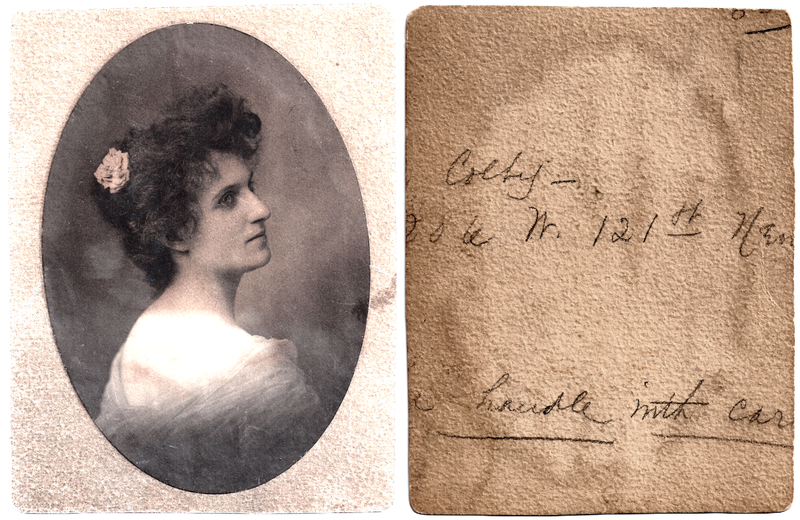 Colby, Ina, musician and costumer. resides 43 Cummings av. Colby, Ina A. pianist. resides 43 Cummings av. She was buried in Mt. 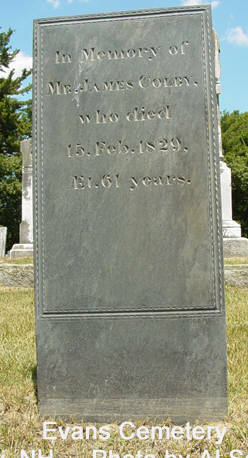 Wollaston Cemetery, Quincy, Massachusetts. Descendant of Israel Hale, of Massachusetts. Daughter of Irvin A. Colby and Clara Hale, his wife. Granddaughter of George Washington Hale and Clara Adeline Neal, his wife. Massachusetts Vital Records, 1841-1910, , Vol: 251 ; Page: 175. 1880 United States. Census Office. 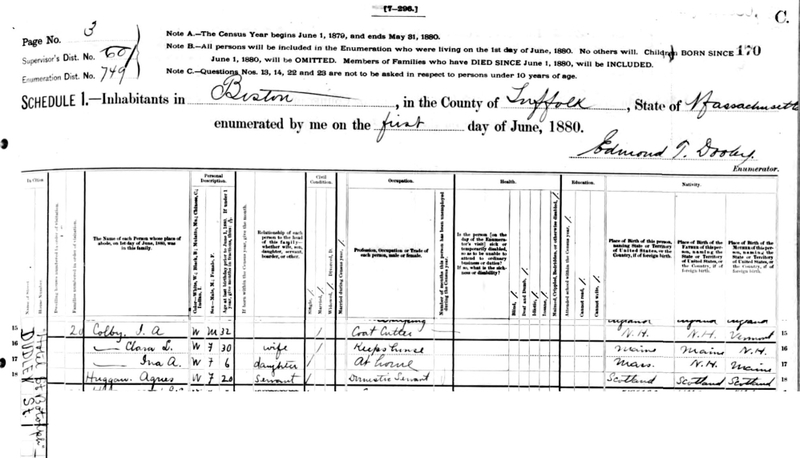 10th census, 1880 federal population census, Washington, District of Columbia: National Archives and Records Service, ([19--]) , Census Place: Boston, Suffolk, Massachusetts; Roll: T9_560; Family History Film: 1254560; Page: 170.3000; Enumeration District: 749; Image: 0121. Annual Report of the School committee of the city of Boston, Boston: Rockwell and Churchill Press, , 1890: page 192. 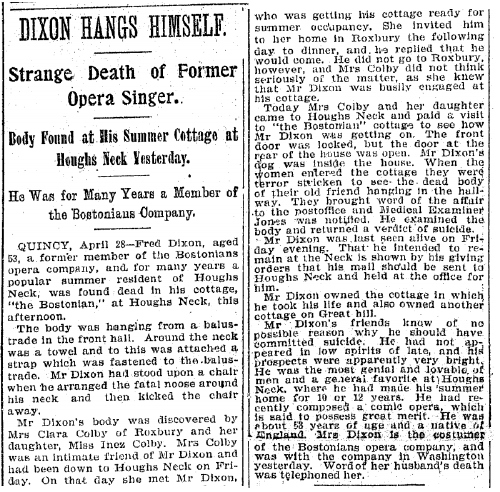 Boston Daily Advertiser, Boston, MA: , Tuesday, May 15, 1894; pg. 8; Issue 116; col E.
Boston Daily Advertiser, Boston, MA: , Tuesday, December 10, 1895; pg. 8; Issue 139; col A.
Boston Daily Advertiser, Boston, MA: , Monday, February 15, 1897; pg. 8; Issue 39; col A. The Vermont Watchman, Montpelier, VT: , Wednesday, December 29, 1897; Issue 52; col A. 1900 United States. Census Office. 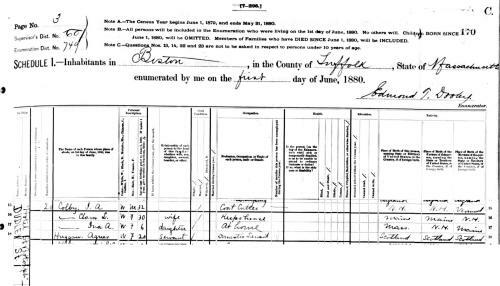 12th census, 1900 population census schedules, Washington, District of Columbia: Bureau of the Census Micro-Film Laboratory, ([197-]) , NEW JERSEY, Series: T623 Roll: 968 Page: 113. Quincy Directory of the inhabitants, business firms, institutions, manufacturing establishments, streets, societies, with index map, state census, etc., Boston, Massachusetts: W. A. Greenough & Co., , 1912, p. 94. 1930 United States. Bureau of the Census. 15th census, United States, 1930 federal census : population schedules ; NARA microfilm publication T626, Washington, District of Columbia: Bureau of the Census Micro-Film Laboratory, ([19--?]) , Census Place: Quincy, Norfolk, Massachusetts; Roll: 936; Page: 4A; Enumeration District: 109; Image: 923.0. Daughters of the American Revolution., Lineage book / National Society of the Daughters of the American Revolution, Washington, D. C.: The Society, (1896-) , DAR ID Number: 13463. 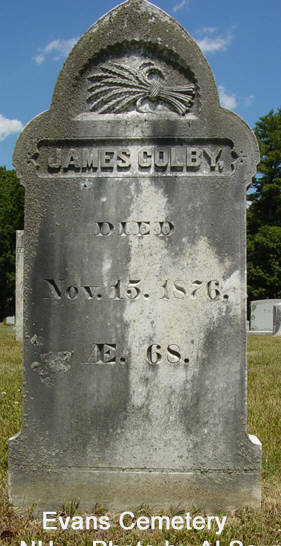 Andrew J. Colby is listed as a Union private with the 8th New Hampshire Infantry, Co. H., which was "organized at Manchester and mustered in December 23, 1861. Left State for Boston, Mass., January 24, 1862; thence sailed for Ship Island, Miss., February 15, arriving there March 15. Attached to Butler's New Orleans Expedition to March, 1862. 1st Brigade, Dept. of the Gulf, to November, 1862. Independent Command, Dept. of the Gulf, to January, 1863. 2nd Brigade, 3rd Division, 19th Army Corps, Dept. of the Gulf, to September, 1863. Colby, I A J, cutter, 198 Elm, boards 16 Laurel. Colby, Irvin A J, cutter, 13 Dock square. boards Parks House. living at Parks House, Boston, Massachusetts. Colby, Irvin A J, tailor, 238 Elm. boards at Stearns' Hotel. Colby, Irvin A J, cutter, 313 Washington. house Hotel Franklin. Colby, Irvin A J, cutter, 493 Washington. house Hotel Franklin. Colby, Irvin A, cutter, 493 Washington, house Lamartine place, Jamaica Plain. Colby, Irvin A J, cutter, 493 Washington, house Dorchester av near Crescent av. Colby, Irvin A J, cutter, 33 Temple place, house Hotel St Botolph [780 Dudley St, now demolished]. Colby, Irvin A J, partner Burdett & Colby, tailors, 39 West, house 1 Everett av, Dorchester [now demolished]. Colby, Irvin A J, partner Burdett & Colby, tailors, 145A Tremont, house 1 Everett av, Dorchester. On March 9, 1888, the following notice appeared in the Boston Daily Globe: "Edward H. Burditt and Irvin A. J. Colby, co-partners doing business under the style of Burditt and Colby, tailors, 145A Tremont steet, Boston, have gone into insolvency. Colby, Irvin A J, tailor, 120 Tremont, house 1 Everett av. Colby, Irvin A J, partner, Colby & Buswell, tailors, 74 Tremont, house 1 Everett av. Colby, Irving A J, partner, Colby & Buswell, tailor, 1 Beacon, rm 43, house 39 Alpine [now demolished]. Colby, Irvin A J, tailor, 1 Beacon, rm 43. Colby, Irvin A J, tailor, 1 Beacon, rm 43, house 38 Regent [now demolished]. Colby, Irving A J, removed to Braintree. Colby, Irving. house 30 Templeton. Colby, Irvin A J, cutter 403 Washington. rooms 7 Fairland, Roxbury. Colby, Irvin A J, cutter 403 Washington. Colby, Irwin A J, foreman. rooms 42 Greenville, Roxbury. Colby, Irwin A J, foreman. rooms 65 Whiting, Roxbury. N.B. - There was also an Irving A. Colby, son of Jonathan Colby, who was born in Lincoln, Vermont on 28 April 1845, just two days after the birth of Irvin A. J. Colby. He was married on April 28, 1868, to Elizabeth S. Elliott, a daughter of Zira Elliott. They had one daughter, Mabel. Civil War Soldiers and Sailors System, at http://www.itd.nps.gov/cwss/soldiers.htm, Film Number M549 roll 3. Massachusetts Vital Records, 1841-1910, , Vol: 255 ; Page: 12. Massachusetts: Grand Lodge of Masons Membership Cards, 1733-1990., , Volume: Cho-Coo Surnames, p. 6049. There is also a web page stating that Irvin A. Colby died on February 22, 1931 in Bronx County, New York at 85 years old. Find A Grave Memorial# 95471578. Record added: Jun 20, 2015. COLBY FAMILY & OTHERS at http://freepages.genealogy.rootsweb.com/~colby/colbyfam, /d146.html. 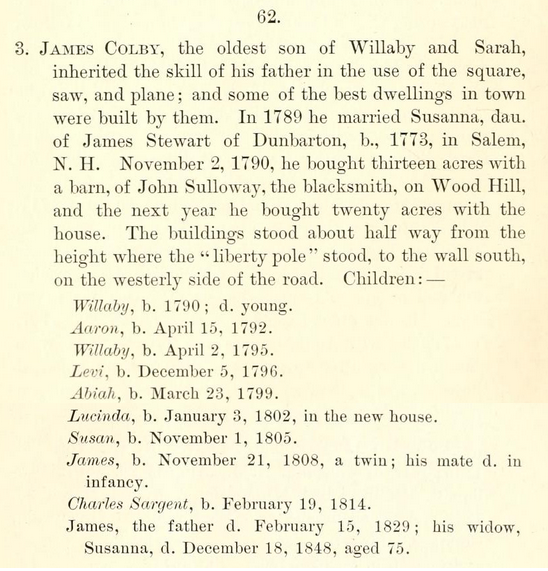 Massachusetts Vital Records, 1841-1910, , Vol: 23 ; Page: 34. Massachusetts Vital Records, 1841-1910, , Vol: 106 ; Page: 118. 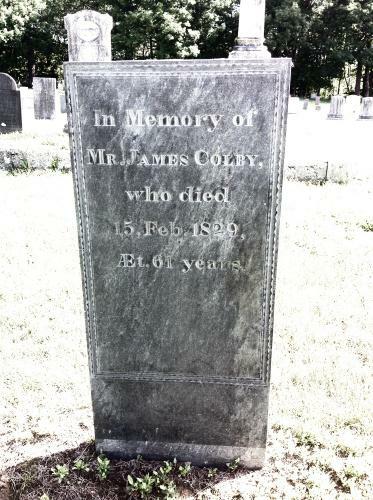 He was the son of Hezekiah Colby and Mary Morse. Massachusetts Vital Records, 1841-1910, , Vol: 125 ; Page: 69.